Albion, originally known as East Haney, is a splendid neighborhood in Maple Ridge, British Columbia. Samuel Robertson and his wife Julie were the first European settlers in the area. Robertson established a fruit orchard in the area which was renamed Albion in 1907, and early industries included canneries, sawmills, and fish boats. The community has a great location with Vancouver about 26 miles to the west of Albion. Vancouver has a population of around 578,000 residents, and Surrey, the next largest city after Vancouver, is located about 12 miles west of Albion and has a population of approximately 395,000 residents. Albion has experienced tremendous growth in the recent years. Newer homes are filling spaces that were formerly more rural in nature. Students in Albion attend schools in the #42 Maple Ridge-Pitt Meadows School District. Many students from other neighborhoods seeking a technical education are attracted to Samuel Robertson Technical Secondary School. The Jamaica Ridge County Fair held each July is popular with locals and draws people from other neighborhoods as well. Albion Park is a popular spot that offers sports facilities, trails picnic areas and is a great place for recreation. 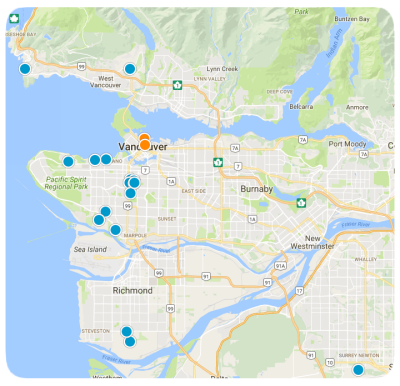 Condominiums, townhomes, single-family homes and lots upon which to build a custom home are all real estate options currently available near the community of Maple Ridge. Condominium listing prices start low and climb up to seven figures for the large and luxurious 4 bedroom, 4 bathroom properties boasting almost 4,000 square feet of living space. Single-family homes needing a bit of loving care can be purchased for very reasonable prices, but a gorgeous 6 bedroom, 8 bathroom home with more than 10,000 square feet will definitely have a seven figure listing price. Lots also have a broad price range with the highest prices found in highly sought-after locations and featuring exceptional waterfront views. Contact us today with any questions or to schedule an appointment to see any of our beautiful properties in the neighborhood of Albion, or any surrounding area near Maple Ridge, British Columbia.